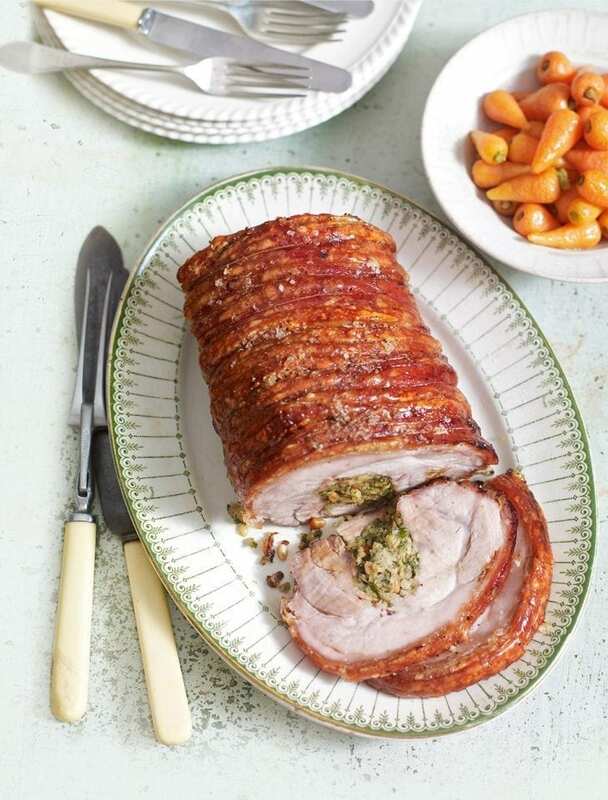 The ultimate pork roast recipe, with perfectly cooked, crisp, golden crackling. Made with a herb and onion stuffing. Pat the pork dry with kitchen towel and leave uncovered in the fridge for 2 hours to dry. Meanwhile, preheat the oven to 240°C/fan220°C/gas 9, or as high as it will go. For the stuffing, heat the oil and butter in a frying pan and gently sauté the onion for 8 minutes until softened. Add the garlic for the last 30 seconds. Set aside to cool. Unroll the pork loin onto a chopping board, skin-side down, long side facing you. Starting and finishing about 2cm from each end, cut a pocket into the pork loin about two-thirds of the way through, to hold the stuffing. In a bowl, mix the onion and garlic together with the remaining stuffing ingredients and season well. Fill the pocket with the stuffing and roll the loin around, securing at 2cm intervals with kitchen string (here’s a step-by-step picture guide on how to do this, or you watch this video). Rub the skin with 1 tbsp sea salt and lots of freshly ground black pepper, working it well into the cuts. Remove the pork from the oven, cover with foil and allow it to rest for 10 minutes before serving. Carve into generous slices, discarding the string as you go. Divide among warm plates, drizzling over any resting or pan juices. Serve with seasonal vegetables and roast potatoes. A loin of pork is the ideal roasting joint because it has a thick layer of fat under the skin, which keeps the meat tender and moist while roasting. There are two things necessary for great crackling: a nice dry rind and a thick layer of fat underneath.